I am glad I chose to study Japanese language! My hometown is Chifeng, which is in Inner Mongolia in the People's Republic of China. If I were to describe my hometown in one word, it would be “vast”. Another would be “grassland”. Not only foreigners, even people from other parts of China describe Inner Mongolia in such a way. “Oh, the place with the never-ending fields of grass,” they say. For me, I would say that my hometown is small but lively, and the people are warm and full of happiness. Since I have not been able to go back for a while, I sure do miss my parents at home (laughter). One thing about my hometown that I am proud of is the famous “Naadam Festival”. It is a traditional Mongolian festival held in mid-July. There are activities such as Mongolian wrestling, horse racing, etc. During the festival, people enjoy eating, drinking, and gathering around a bonfire together. It is the liveliest time of the year in my hometown. However, I am unfortunately going to miss it this year. What kind of drink and food are popular in your hometown? The alcohol content in the liquor is quite high (laughter). My grandfather’s favorite liquor contains about 40% of alcohol. He drinks it straight from a small cup. As for food, we eat Chinese buns and rice every day. And we also eat a lot of meat. We have a cuisine called “air-dried beef” made of beef that was dried and then fried, and it is famous all over China. We mainly season our food with salt, but people who like spicy food will add chili pepper to their food. How do you eat the rice? We eat rice along with other dishes, just about the same as in Japan. And the dishes are mainly cooked meat, such as steamed meat, barbecued meat and stir-fried meat, which is then seasoned with salt. And we eat a lot of sheep meat, which is actually not only popular in my hometown, but all over China. However, I have not been able to find sheep meat in the shops around here. Sometimes I crave for it, but for now I am bearing without it. (After hearing that there is a shop selling sheep meat): Oh really?! There is a shop selling sheep meat? Where is it? I will go there immediately! By the way, you came to Hiroshima University (Graduate School of Letters) last October, right? Yes, I am in my 2nd year in the Graduate School of Letters now. My major is Japanese literature and I am doing research on Dr. Shizuka Shirakawa’s study on “Shikyou” (Shijing: The Classic of Poetry). 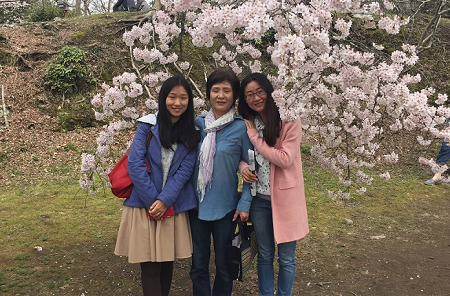 Before coming to Japan, I was a student of University of Science and Technology Beijing and studied Japanese for four years during my undergraduate days. Then, I started majoring in Japanese literature after entering the master’s course of Beijing Normal University. And now I am here for my 2nd year of the master’s course at Hiroshima University. What made you want to study Japanese Language? Actually, studying Japanese Language was not my first choice. I was aiming to study something else but my examination results were not good enough to enter the course I had originally planned to enter. So, I ultimately chose Japanese language (laughter). Even after taking up Japanese language, at the beginning of my 1st year in university I still had the urge to change my major to my intended goal. But after participating in the lessons held by my wonderful Japanese teachers, by the end of the 1st year I had changed my mind and decided to continue studying Japanese language. You are lucky to have met good teachers. Yes, indeed. My teachers taught me a lot. My teachers lived in dormitories on campus. Sometimes, I would go visit my teachers in their dormitory room with my friends, and we would cook and eat together. It was really fun. I learned a lot about Japanese people and Japan affairs from them. As I got to know more about Japan, my interest in Japan deepened. I owe it all to my teachers who motivated me to come and study in Japan. 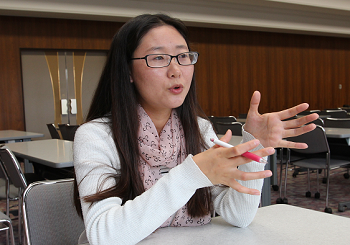 Did you have any difficulties with your preparations to study in Japan? I had no difficulties at all. I had to look for a supervisor for my research beforehand. 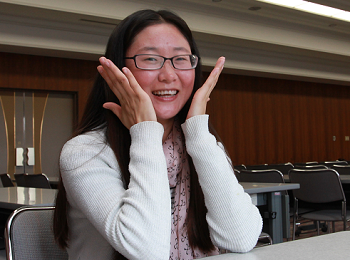 But I managed to find my present supervisor through the Hiroshima University webpage. The professor accepted my request instantly, and we corresponded a few times before my departure. My professor was quick in responding and therefore the preparation went very smoothly. And so then you came to Japan. What was your first impression of Hiroshima University? My first impression was “what a large campus!” It was October when I first came here, the red maple leaves season. I was really impressed with the beauty of the maple leaves on campus. Fragrant Hills Park (Xiangshan Park) in Beijing is famous for its maple leaves too, but I have not gone to see the maple leaves there before. So when I saw the maple leaves on Hiroshima University’s campus, I said to myself, “So, this is what maple leaves look like!” The day after I arrived, I went to visit the research room of Chinese literature. At one look, I thought “So this is Hiroshima University, indeed.” There is a great collection of books, many which I have never seen before in my own country. I was really excited. Did you get used to the life in the dormitory right away? Yes. Thanks to the supporter system at Hiroshima University, I was able to receive a lot of help from the supporters in miscellaneous, everyday life questions and needs. They brought us to the banks, city hall, and helped us with the necessary procedures to start our new lives on campus. I am really grateful for their help. 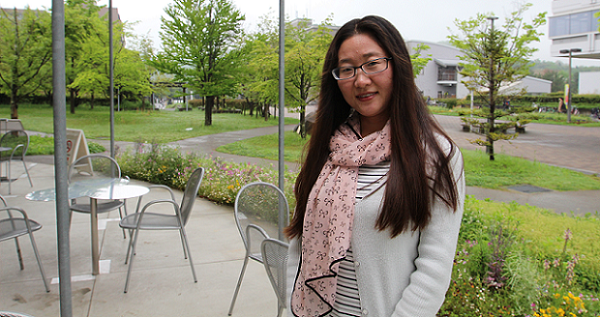 Also, since there are many students from China at Hiroshima University, we have the Association of Chinese Students at Hiroshima University that helps support the fellow students from China in their daily lives and studies. We mainly use WeChat, the communication app used in China, to exchange information. There is an orientation for newcomers where information on shops and value buys are provided in paper form. 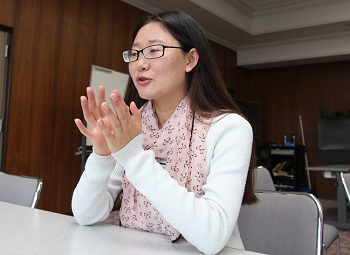 Could you tell us about your research on “Shikyou” (Shijing: The Classic of Poetry)? “Shikyou” (Shijing: The Classic of Poetry) is the oldest existing collection of Chinese poetry, and has been studied and memorized by scholars for a very long time. 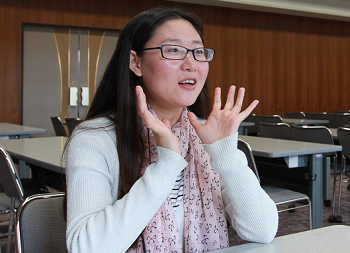 Amongst the scholars, Dr. Shizuka Shirakawa studied the poetry from a literary perspective. I found his interpretation to be unique and convincing. For example, regarding the origin of “poetry”, he stated that the original function of “poetry” was to be a means for humans to connect with god. In short, an individual sings to god to convey his prayers, wishes, curses or thoughts. And “poetry” is the result of this action. Yes. Some people say that literature is born from a place of ritual, and I totally agree with that. Poetry is written in “verse”, right? In the place of ritual, words dedicated to god, ancestors and spirits of the dead were originally in “verse”. The verse was then passed down to the later generations, and then comes “poetry”. Society changes with the flow of time, bringing changes to people’s lives too. In short, the literature that originated from the place of ritual also changed along with the change in people’s life, the tinge of “curse” gradually faded and became the poetry we are familiar with today. Besides that, “Soji” (Chu Ci) is another anthology of Chinese poetry, said to be as old as “Shikyou” (Shijing: The Classic of Poetry). Dr. Iwatomo Fujino is one famous researcher who elaborated his interpretation of “Soji” (Chu Ci) from the point of view of “miko” (shamanism) in his book, “Fukei Bungaku ron”. Therefore, I suppose, if “Soji” (Chu Ci), which originates from the southern part of China can be explained from this point of view, probably I could do the same with “Shikyou” (Shijing: The Classic of Poetry), which originates from the northern part of China. I am hoping to get new findings by making comparison between these two collections of Chinese poetry. Thank you for your kind explanations. By the way, how do you find the lectures at Hiroshima University? I find the professors to be very strict (laughter). In the lectures I take for my major, students are required to make presentations. In the “Shuowen Jiezi” (to explain graphs and analyze characters) class I took in the first semester, I had to prepare four presentations. It was really tough! What kind of presentation did you make for the “Shuowen Jiezi” class? “Shuowen Jiezi” is the Chinese character dictionary compiled according to radicals (graphical components of Chinese characters) by Xu Shen, a Han Dynasty scholar. This dictionary was later annotated by a Qing scholar, Duan Yucai, and became the textbook we use today. We are given assignments on this book, so we had to conduct research on it and make presentations based on the results of our research. Although the professors were strict, it was an amazing learning experience. When I was in China, I studied Japanese literature, and so I didn’t have much knowledge of Chinese classics. But thanks to the lectures at Hiroshima University, I gained some basic knowledge on them. The professors were very dedicated in guiding us, and introduced many books to us. I am very glad to have gotten to read the many good books recommended by them. What do you think of Japanese students? I think they are quite serious in their studies. They are more versed in Chinese classics than me (laughter). I work part-time together with some Japanese friends, and I find them to be independent and quiet. When we have discussions in class, sometimes I can feel that they have something in their mind, but they just do not speak up. When I was in my university in Beijing, everybody was eager to give their opinion so much that sometimes it may have appeared as if we were fighting (laughter). Japanese people obey rules, which I think is really wonderful. However, I feel that they lack “open-mindedness”. I feel that they are reluctant to accept others. Having spent some time living with Japanese people, I can feel that they distinctively divide people into “uchi” (the in-group) and “soto” (the out-group). They can be nice to you, but somehow it is difficult to understand what they are actually thinking. So, sometimes I have difficulties dealing with my relationships with Japanese friends. Meanwhile, I am glad to have met friends in my current lab who are irreplaceable. Although they are not many in number, we understand each other and get along well. I hope to continue keeping in touch with them even after I go back to my home country. How is the food at the university cafeteria? I think it is delicious. It is not too salty, and I think it is healthy. Because of that, after coming to Japan, I no longer have an acne problem. It’s good to hear that. By the way, what kind of food do you cook at home? Usually I cook Chinese home cooked dishes. For example, boiled dumplings. I often cook together with a Japanese friend who studied in China for 2 years, and she is really an amazing cook. I am always impressed with her cooking (laughter). In my hometown, we mainly eat boiled dumplings. But if there are some leftovers, we will fry them the next day. Dumplings are good both ways. Did you participate in the university festival or other local festivals? Yes, I joined the “Sake Matsuri Festival” last year. I think that is a very typical Japanese festival, and something we can only see in Japan. I like the atmosphere where colleagues, or friends, or family members gather together sitting on a tatami, eating, drinking and chatting. I don’t like alcohol that is too strong, and so I find Japanese sake to be just right. I like it very much. The alcohol content in Japanese sake is quite high actually. Oh, really? But the liquor I usually drink with my father and grandfather is much stronger (laughter). What advice do you have for your juniors who are interested in studying abroad? Hiroshima University has massive collection of books and materials, and I think it is a very good environment for students. So, I would advise those who are here to make use of them and gain as much knowledge as possible. Also, I would recommend them to participate in a homestay. It is not only fun, but it is also a worthwhile experience to see a real Japanese family’s life from a firsthand perspective. The chance to study abroad is valuable, and if there is an opportunity to do so, I would advise those with the courage to take up the challenge. One does not have to be fluent in Japanese to do so. Could you tell us your dream? I will be going back to China this coming fall, and I will enter my 3rd year of being a master’s student. I will have to decide whether to continue studying or to look for a job. For now, I hope to teach Japanese language one day. I owe it all to my teachers in Beijing for giving me my interest Japanese language. If it weren’t for them, I might have changed my major to something else. But now, I am glad I chose to study Japanese. Nowadays, people in China, especially the people of my parents’ generation, do not know much about Japan. Because of that, they have different perceptions on many things. If I become a Japanese language teacher one day, I would like to introduce the Japan I know to people in China, and show them more about Japan. Whatever it is that I do, I would like to do my best. At the “Sakura Matsuri” (Cherry Blossom Festival) in Mihara. My host parents in Miyoshi brought me and another Chinese friend there. At the ‘Kurahashi Festival’ in Kurahashi Town in Kure. 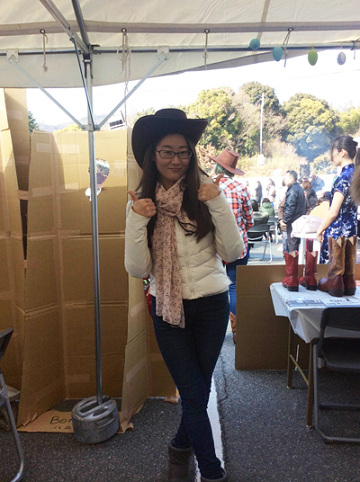 I helped introduced American “cowboy culture” to the local people along with my fellow friends from Hiroshima University. 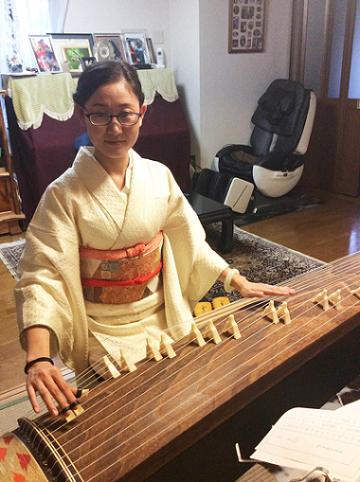 Wearing a ‘kimono’ and playing the ‘koto’ (Japanese harp) at my host sister’s house in Shobara. Visited the Hiroshima Peace Memorial Park and the Atomic Bomb ruins. I was terrified to learn about the terror of war and the lifelong agony it had brought about to the people involved. 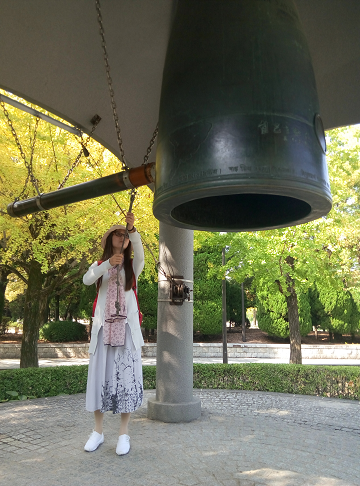 I rang the Bell of Peace while praying for peace in the world.